POLYPIPE Manufacturer's Part Number: PB015. 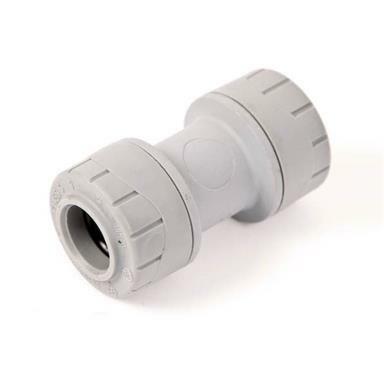 POLYPIPE PolyPlumb Straight Coupler, 15mm x 15mm, PolyPlumb Push-Fit Socket x PolyPlumb Push-Fit Socket. - High performance stainless steel grab ring ensures superb joint integrity. - Demountable only by dis-assembling: Reduces potential for tampering. - Please note: All PolyPlumb fittings are supplied with pre-lubricated EPDM 'O' rings. If for any reason further lubrication is required only Polypipe silicone lubricant should be used (purchased separately). Substances such as solder flux must not be used. - Caution: Do NOT insert fingers into the PolyPlumb fittings, as the grab ring is sharp and designed to grip.